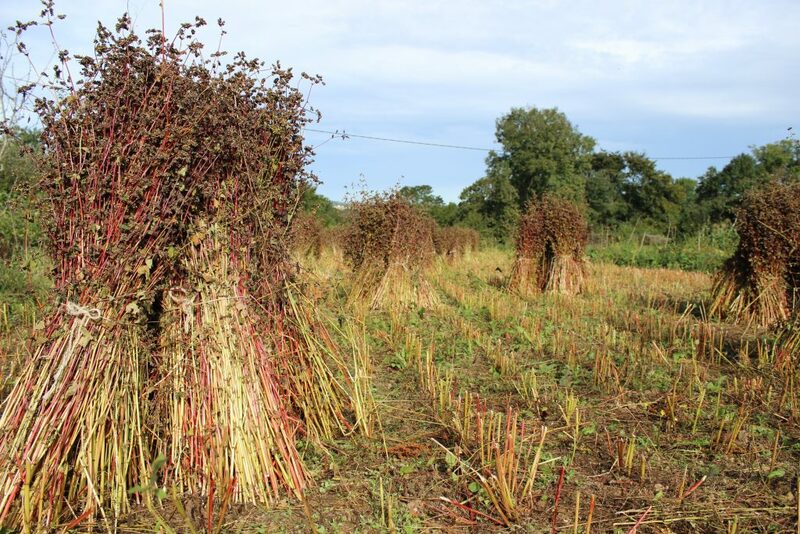 Buckwheat is cut, made into bundles and left to dry for a week or so in the field, before being threshed. Farmers used to grow a greater variety of crops than they do now – buckwheat, for instance, was once widely grown in many parts of Europe and Asia, and formed a staple part of the diet in many areas. Crops such as buckwheat have fallen into relative disuse because they do not fit in with modern farming methods. It was traditionally used at the end of a rotation cycle, before a field was given a new dose of fresh compost; the plants do well in poor soil, not growing too big, and putting more of their energy into seed production. If you treat the crop with inorganic fertilisers, vegetative growth is stimulated, the plants get too big, the stems are too weak, and the crop falls over, making it impossible to harvest with a combine harvester. Also, unlike cereals, buckwheat has a long flowering period, and some of the grains ripen weeks before others. This is countered by cutting the crop, tying it into bundles, and standing the bundles in the sun, in the fields. The immature grains ripen, whilst the mature grains are held in place in the centre of the bundles. The plants can then be threshed on a fine day, to give the maximum yield. This system also helps to dry out the buckwheat straw, which can be used as a thatching material, or to cover woodpiles, etc. A crop of buckwheat helps to clear a field of weeds, it is planted late – May or early June – giving you a chance to hoe up the winter and spring weeds, and grows very rapidly, so that it shades out the summer weeds.